One of them is a pilot in space, the other an ad director. Which one is which? According to a 2011 Parks Associate study, there are over 135 million gamers in the USA. We all are aware of the “overweight gamer” stereotype, but what is surprising is that a video game can actually inspire someone to get fit. Witness Marcus Dickinson, an EVE Online player who was inspired by his Avatar to get into the best shape of his life. Created by CCP Games in 2003, EVE Online is a multi-player role playing game with a vast universe that boasts over 7,500 star systems. Its 400,000 subscribers are immersed in a universe where players build ships, trade or manufacture goods, form corporations and juggle for power. Occasionally killing each other off. There even was a giant banking scam surrounding EVE Online that was covered in the New York Times. This caused a huge scandal worthy of the Lehman Brothers. This all illustrates that people take EVE Online seriously. Very Seriously. When Marcus Dickinson started playing EVE Online he was a 230 pound obese advertising director in Canada. A complete opposite of his online character, Roc Weiler – a ripped ex-pilot from… no idea where. You can read Roc’s bio here. He even makes his own music. The more time Marcus spent playing as Roc Weiler, the less true he felt to his “brand.” The final straw was when he met real EVE Online players in 2009 in Iceland at a FanFest event. He realized that his real identity was completely different from his online identity. This began a positive change in his diet and fitness regimen. Workout programs (P90x), healthy diet and weightlifting helped to transform Marcus Dickinson to look more like Roc Weiler. He shed 50 pounds and now boasts a lean figure of only 14% body fat. 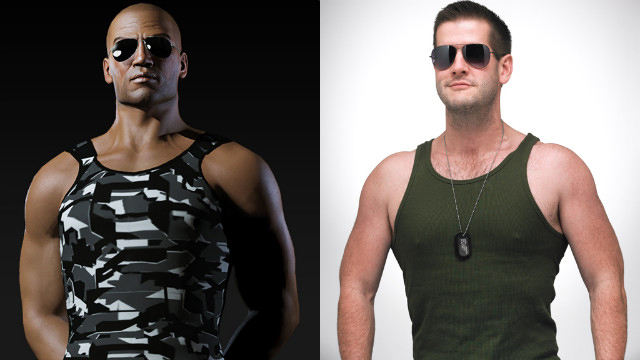 While Marcus may look more like his avatar every day there is one major difference. Roc Weiler is a badass pilot from the Minmatar Republic and now travels the star systems of EVE Online, Marcus Dickinson lives in Canada.